ECOFACT staff are experts in the identification of juvenile lampreys. Juvenile lamprey (ammocoetes) can be identified to species level in the field (for the majority of specimens) using the key ‘Identifying Lamprey. A field key for Sea, River and Brook Lamprey‘ by Gardiner (2003). This is the key we use, and the methodology we outline below has been taken from this key. To aid identification the use of a smooth white board and appropriate magnifiers are recommended. Flexible, light stainless steel forceps are also useful for handling small ammocoetes. The use of anaesthetics is recommended to assist in identification and measurement of juvenile lamprey and to allow for handling that minimises damage to the specimens. The identification of ammocoetes and transformers to the following categories should be possible for surveys carried out between August and October: River/Brook Lamprey ammocoetes; Sea Lamprey ammocoetes; River/Brook Lamprey transformers; and Sea Lamprey transformers. Trunk myomeres provide an unambiguous corroboration of juvenile lamprey identification. The trunk myomeres are those between the posterior (7th) gill opening and the cloaca. The number of trunk myomeres in River/Brook Lamprey is generally 57-66 while it is generally 69-75 in Sea Lampreys. We recommend using myomere counting on all juvenile specimens that have ‘sea lamprey type’ pigmentation. It should be noted that identification of ammocoetes to River or Brook Lamprey before transformation is not possible in the field using external characteristics. However consider the presence of any barriers to migration downstream of your site. If there are impassable barriers (i.e. dams and weirs) downstream of your survey site you are unlikely to encounter an anadromous river lamprey population. 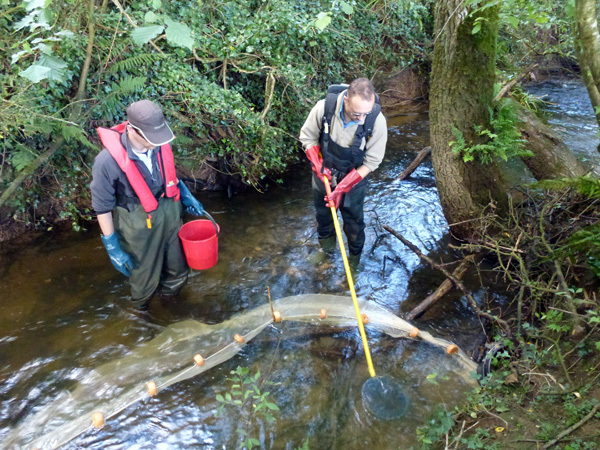 It may be possible to distinguish River or Brook Lamprey transformers by late autumn/early winter. A light-coloured background (such as a smooth, white formica board) works well for looking at the pigment pattern in the caudal fin of ammocoetes. This is particularly true with small ammocoetes, as the spread of pigmentation into the caudal fin of sea lamprey ammocoetes is less intense in small specimens. Any ammocoetes that show definite signs of transformation, such as enlargement and differentiation of the eye and changes to the head shape, should be classed as transformers, even if ammocoete colouration is present and the sucker is not properly formed. Importantly, during the early stages of transformation, occurring in the summer, adult characteristics are not sufficiently developed to allow their use in identification and the characteristics of ammocoetes should be used, with the lamprey being classed as a transformer, rather than as an ammocoete. Morphometric measurements are useful in confirming the identity of River Lamprey and Brook Lamprey transformers. Populations dominated by small Lampetra transformers should not be assumed to be of River Lamprey, as Brook Lamprey may occur. River Lamprey transformers will be easily identified from their appearance from October in some rivers; however, this is not universally reliable. 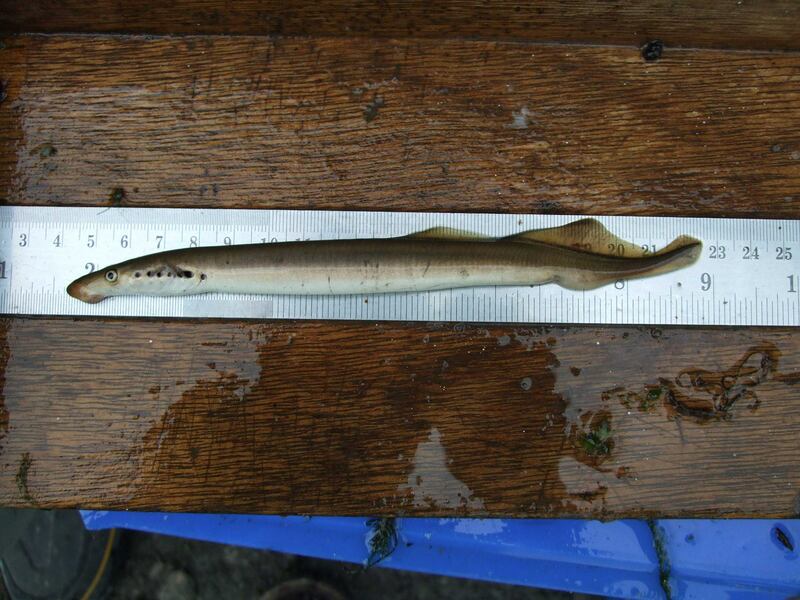 Sea lamprey transformers are uncommonly recorded in samples, but could occur from late summer to November / December. Towards the end of this period, specimens are blue-black towards the dorsal surface, with a silver ventral surface and with prominent oral disc (8% or more of the total length) and large eyes (about 2.7% of the total length). 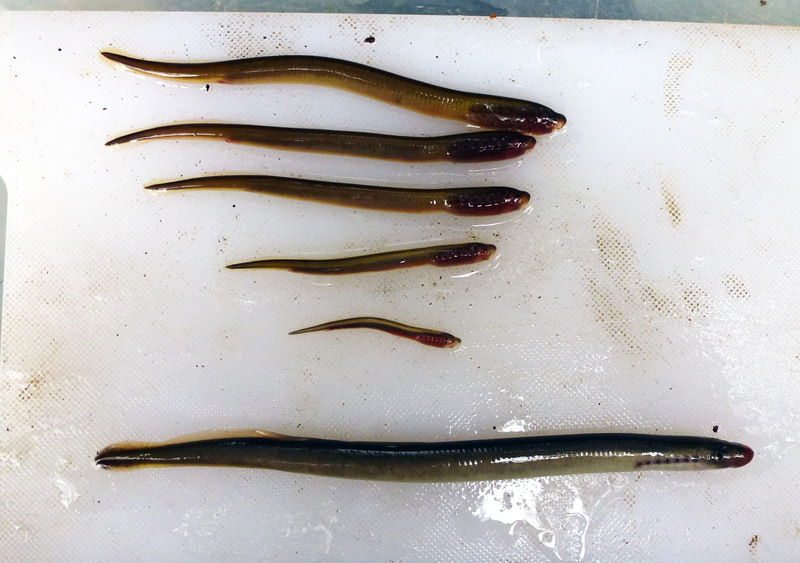 The top specimen in the the photo in Plate 2 is a juvenile brook / river lamprey ammocoete (Lampetra sp.). It is not possible to identify Lampetra sp. ammocoetes to species level. 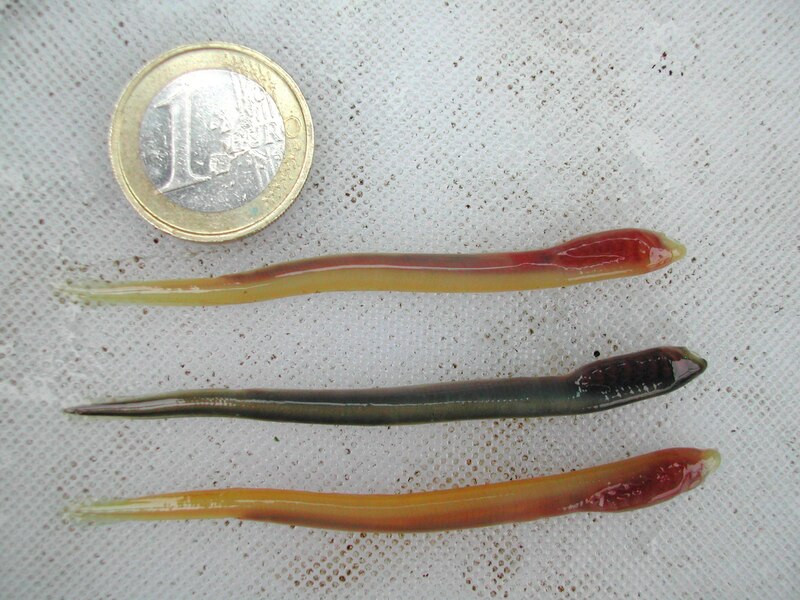 The middle specimen is a sea lamprey Petromyzon marinus, identified from both pigmentation characteristics and trunk myomere counting. 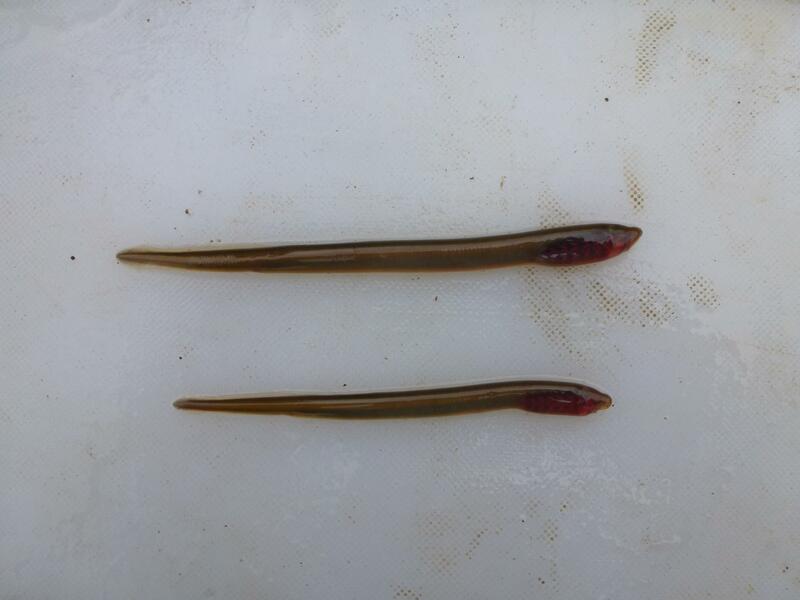 The bottom individual is probably a river lamprey Lampetra fluviatilis transformer, identified from a number of characteristics including size at transformation. 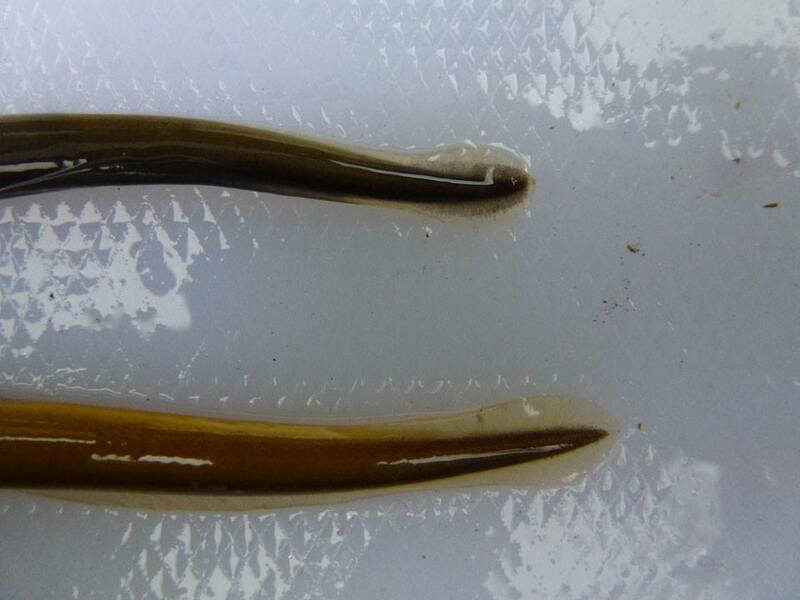 Juvenile brook/river lamprey and sea lamprey (ammocoetes) can be distinguished on the basis of pigmentation on their tails and oral hoods. However, this can be problematic and trunk myomere counting is recommended. The two individuals in Plate 3 below are from the River Inny catchment and the individual on the top is exhibiting sea lamprey type pigmentation. Myomere counting confirmed that this was if fact a brook/river lamprey. Considering the geographical location of the River Inny (Midlands and above the Shannon scheme) we can be sure that both of these are brook lampreys Lampetra planeri. The picture in Plate 4 below is of a fully transformed juvenile sea lamprey (bottom) and brook lamprey ammocoetes from the River Mulkear catchment, Co Limerick.Plate 5 below is of two sea lamprey Petromyzon marinus ammocoetes from the River Mulkear catchment, Co Limerick. Note that pigmentation extends ventrally on the oral hood, tail is ‘sword’ rather than ‘paddle’ shaped, and pigmentation extends out into tail. We confirmed the identification by counting the trunk myomeres, before releasing these (recommended).You won’t see many of these during a lamprey survey; Plate 6 below shows very unusual non-pigmented albino Brook lamprey Ammocoetes from the River Nire, Co Waterford. Plate 2 The top specimen in the this photo is a juvenile brook / river lamprey ammocoete (Lampetra sp.). The middle specimen is a sea lamprey Petromyzon marinus ammocoete. The bottom individual is probably a river lamprey Lampetra fluviatilis transformer. Adult lamprey (ammocoetes) are much easier to identify to species level in the field using the key ‘Identifying Lamprey. A field key for Sea, River and Brook Lamprey‘ by Gardiner (2003). Examples of the three Irish species are provided below in Plates 7,8 and 9. Adult sea lampreys are generally very recognisable by their size and characteristic colouration. They are over 500 mm in length (typically 600–900 mm). The main difference between adult Brook lampreys and River lampreys is size, as adult Brook lampreys are smaller. Adult river lampreys are 180–500 mm in length (typically 250–400 mm). 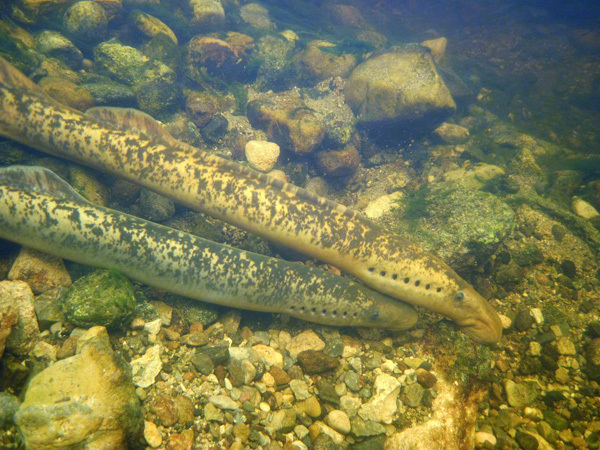 Although adult brook lampreys often exceed 130 mm in length, populations are dominated by smaller individuals of length 90–120 mm. 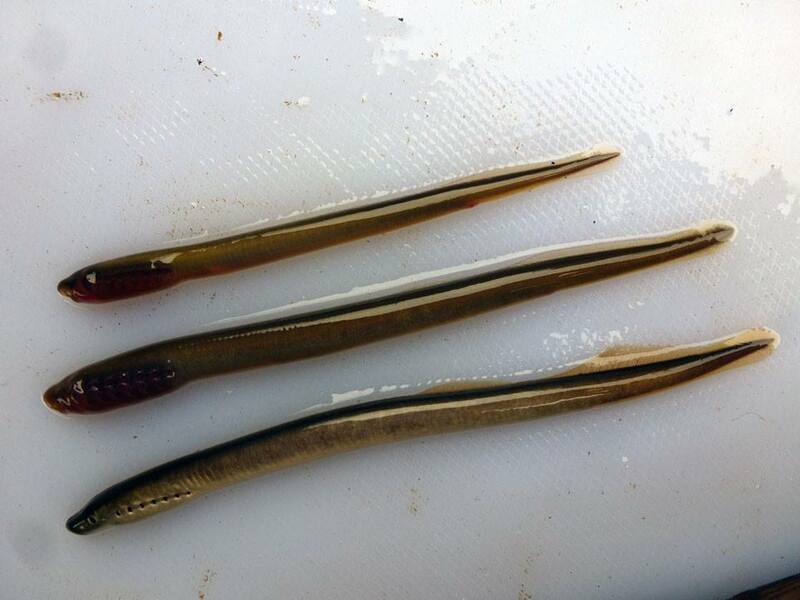 Brook lamprey adults are also not well silvered, and usually not silvered on the lateral surfaces. The are grey-brown to brown in colour, sometimes with mottling. As lampreys cannot get past many dams and other obstacles like large weirs, you can often know what species you are dealing with when you consider the presence/absence of downstream barriers to migration. 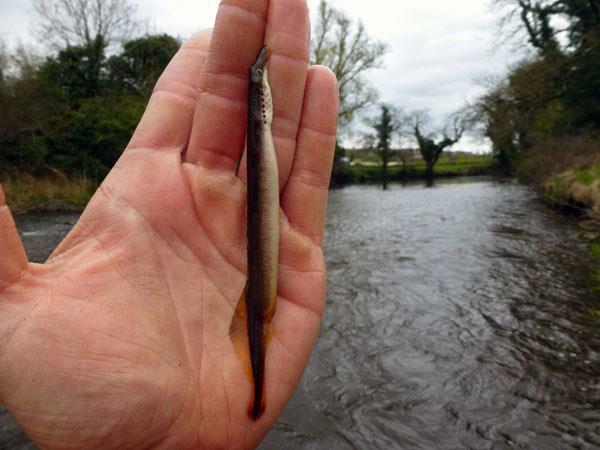 The individual in Plate 7, for example, was recorded in the Erne catchment above the ESB dams at Ballyshannon and Cliff, which are impassible to all species of lampreys. Plate 7 Adult Brook Lamprey Lampetra planeri, Erne catchment. Plate 8 Adult River Lamprey Lampetra fluviatilis from the River Fergus. Plate 9 Adult sea lampreys Petromyzon marinus on the Old River Shannon. Gardiner, R. (2003) Identifying Lamprey. A field key for Sea, River and Brook Lamprey. Conserving Natura 2000 Rivers Conservation Techniques Series No. 4. English Nature, Peterborough. The above key was produced as part of Life in UK Rivers. This was a project to develop methods for conserving the wildlife and habitats of rivers within the Natura 2000 network of protected European sites. Also if you have any queries regarding lampreys, or aquatic ecology issues in general, please do not hesitate to contact us.